According to Bureau of Meteorology computer generated forecast rainfall maps, it looks like it's going to get wetter in the South-East corner from now until Tuesday. 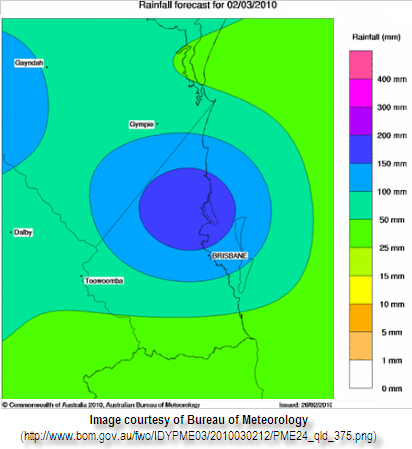 The rainfall forecast maps show an expected 10-15mm falling in the Gold Coast area on Sunday, 15-25mm on Monday, and between 25-50mm in the south and 50-100mm in the northern areas of the Gold Coast. It appears though the heaviest of the rainfall will be north of Brisbane (including Caboolture and the Sunshine Coast) with falls anywhere between 100-200mm. Depending on how quickly this amount of rain falls, we may see a repeat of localised flash flooding affecting low-lying areas. We'll keep you updated on any chances in the forecast and if any Severe Weather Warnings are issued.